How much candy is too much on Halloween? With candy practically falling from the sky on Halloween, many kids will overindulge on sugary sweets during all the festivities. While that can be part of the fun of the holiday, there are plenty of ways to enjoy candy without overdoing it, says Dana Hunnes, senior dietitian at Ronald Reagan UCLA Medical Center and adjunct assistant professor at the UCLA Fielding School of Public Health. "Halloween is a great opportunity to teach kids about balance when it comes to nutrition," she says. Just how much candy is okay for kids to have? We asked Hunnes about that and how to enjoy Halloween in moderation. What's a safe amount of candy for kids? "Keep a careful watch on what kids are getting on Halloween," Hunnes says. "I would let kids choose their two to three favorite pieces of candy – individual or fun-size servings – and limit it to that the day-of." She recommends that parents set up an allowance where they collect the candy kids gathered from trick-or-treating and allow them to have a piece of candy as a nightly dessert. The key is to help kids see candy as an occasional dessert – not a snack. Is it okay to gorge on candy just for the day? "In general, it’s worse to binge on candy one night than to have it as an every-so-often treat," Hunnes says. "By having it occasionally, we teach ourselves more balance with our diet, and that it’s possible to enjoy something without overdoing it." Sometimes, she says, it will depend on the person. "If you’re one of those people where it’s all or nothing, then perhaps a candy binge followed by 100% clean eating is better for you." Which types of candy are the worst for you? 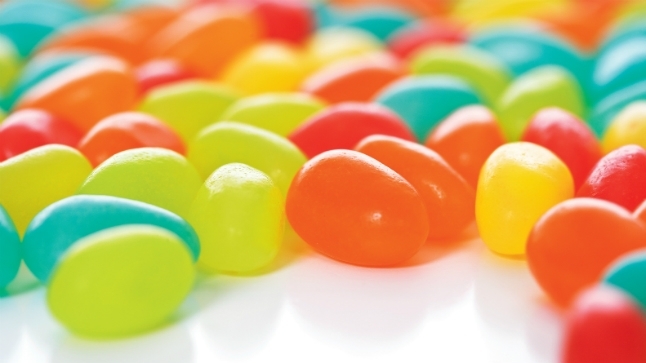 "Things like smarties or jelly beans might be worst for kids because they are nearly all sugar and dyes – on top of being sticky, which is bad for teeth," Hunnes says. Sugar, of course, is one of the biggest goblins of Halloween. The American Heart Association recommends children limit their added sugar intake to no more than 100 calories per day. It's important to note that there is technically no safe limit on sugar; the less, the better, says Hunnes. "Find candies that aren't packed with as much added sugar. The least unhealthy candies are ones like dark-chocolate coated peanuts or raisins because at least there's some real food in them. Granola bars, KIND bars, and similar types of treats also tend to be a little bit better." What are other ways to avoid overindulging? "It can be difficult, but parents should remember to lead by example and limit their candy intake on Halloween, too," Hunnes says. "Follow the same rules you're setting for your children." One way to do this is to avoid using candy as a snack to keep you full. Instead, make sure it's a treat – not a staple of your meal makeup for the day. "It's when we are most hungry that we're most vulnerable to temptation," she says. "Never eat candy on an empty stomach."